Everybody’s working for the weekend…that is, everybody except for members of LakewoodAlive’s most experienced team of volunteers. The weekend, after all, is when this ultra-dedicated group springs to action. 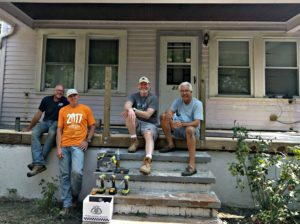 A Team members (from left to right) Aaron Cooper, Dana Paul, Jim Hayes and Carl Orban pose while repairing a front porch on Dowd Avenue. Lakewood residents Aaron Cooper, Jeff Davis, Jim Hayes, Carl Orban and Dana Paul comprise the all-star squad of volunteers known as the “A Team.” This quintet spends various Saturdays and Sundays throughout the year tackling major volunteer housing projects on behalf of the LakewoodAlive Housing Outreach Program. Although they vary in age (ranging from early-thirties to upper-sixties) and employment (ranging from corporate professionals to retirees), all five members of the A Team share two distinct traits: A general level of expertise with building projects and a strong desire to use their talents to help fellow community members in need. 2017 proved a banner year for the A Team. Not only did this volunteer group gain two new members (Davis and Hayes), but it also soared to new heights with its volunteering productivity. 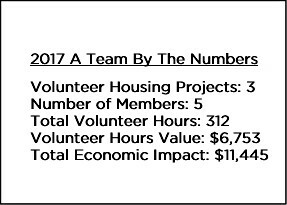 This year saw the A Team complete three major volunteer housing projects, accumulating 312 total volunteer hours and generating $11,445 worth of economic impact for homeowners within our community. 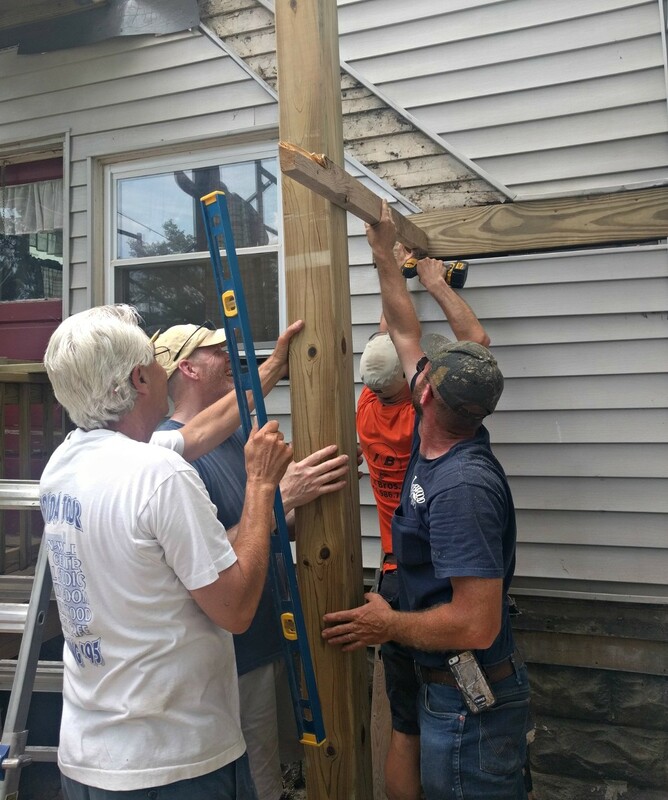 A Team members (from left to right) Carl Orban, Jim Hayes, Aaron Cooper and Jeff Davis work on reconstructing a two-story porch on Elmwood Avenue. 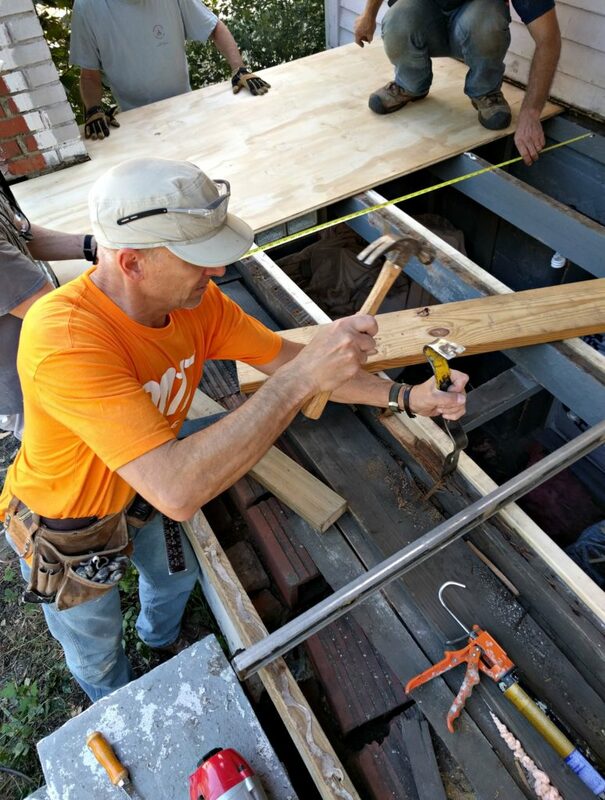 The year began with the A Team completing a two-story porch replacement they started last fall. 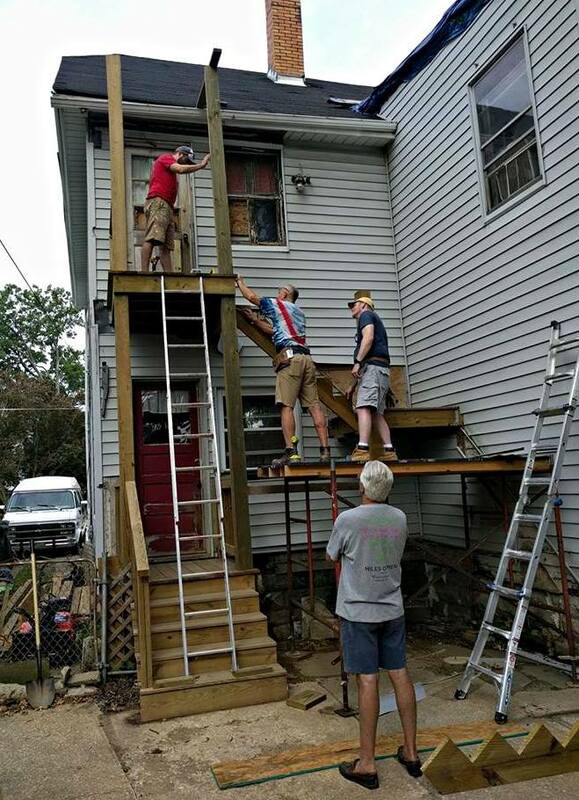 Thanks to their efforts, an elderly resident on Elmwood Avenue has seen her once-unsafe rear entranceway transform into a newly-designed porch. 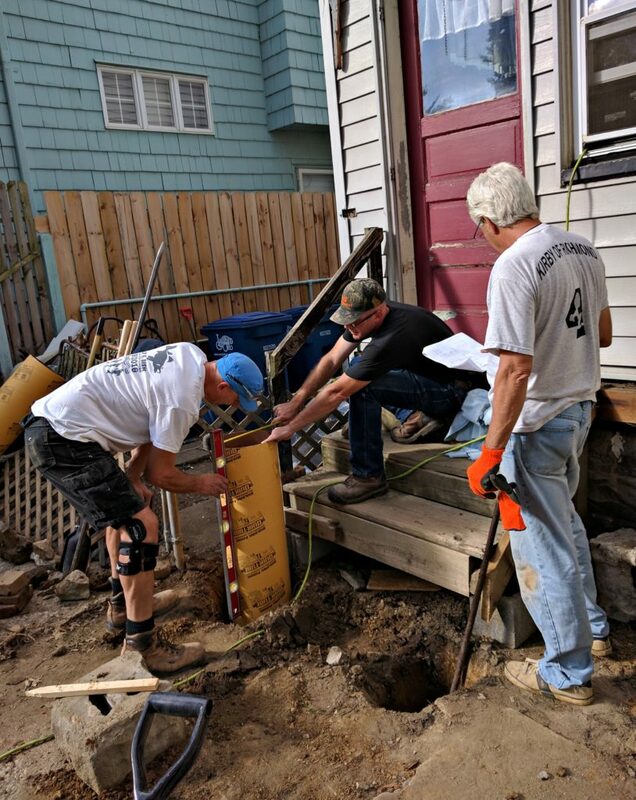 When this resident was referred to LakewoodAlive by the City of Lakewood’s Building Department due to the poor condition of her rear porch, the A Team agreed to tackle this challenging project. The resident was presented with an opportunity to have her porch reconstructed through LakewoodAlive’s 80/20 Volunteer Project Supply Fund, whereby the homeowner pays 20 percent of the project cost and LakewoodAlive covers the remaining 80 percent using funding provided by First Federal Lakewood. The labor was completed free-of-charge. 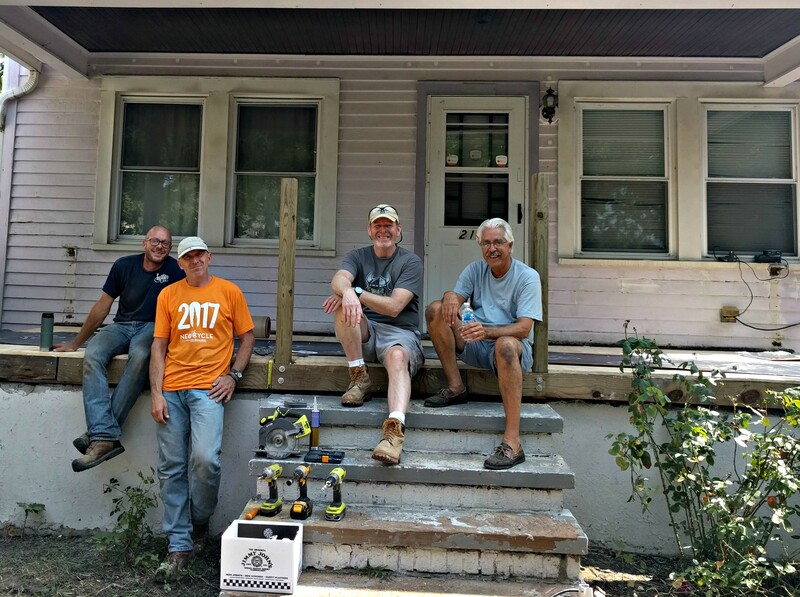 Equipped with design assistance courtesy of LakewoodAlive board member Jim “JP” Ptacek, the A Team set about tearing down the unsafe porch and constructing a new two-story porch. This process entailed everything from crafting a porch design and obtaining a building permit to digging a foundation and constructing two separate levels of the porch. For Hayes and Davis, the Elmwood Avenue porch reconstruction project marked their indoctrination into the A Team. A Team members (from left to right) Jeff Davis, Aaron Cooper and Dana Paul join forces on a step replacement project on Lakewood Avenue. Following the Elmwood Avenue porch reconstruction project, the A Team completed two additional projects that were less time-intensive yet made significant impacts on the lives of their respective homeowners. 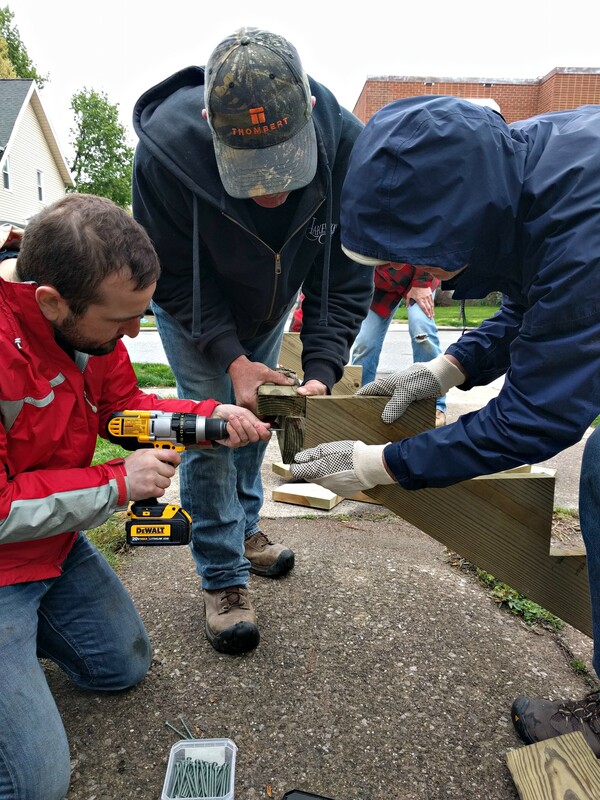 A project on Lakewood Avenue resulted in a step replacement, while a project on Dowd Avenue in Lakewood’s Historic Birdtown Neighborhood involved repairing a grateful homeowner’s front porch. Despite the large volunteer workload, members of the A Team also made time on two occasions during 2017 to host get-togethers to celebrate their successful projects and meet each other’s families. A Team members (from left to right) Jeff Davis, Dana Paul, Jim Hayes and Carl Orban construct the second level of the porch at Elmwood Avenue.